Modular and Harlot San Francisco is giving you the opportunity for some mental spring cleaning as we give you two days of mayhem in May. Two days back to back with Kolombo, Lee Curtiss, Lauren Lane, JOill, Keith Kraft, Crosstalk, Pedro Arbulu and MFYRS. $20 Ticket – Guaranteed entry to both events and two complimentary drinks (free drinks only valid before midnight). May 16th. Lee Curtiss, Lauren Lane, JOill. May 17th. 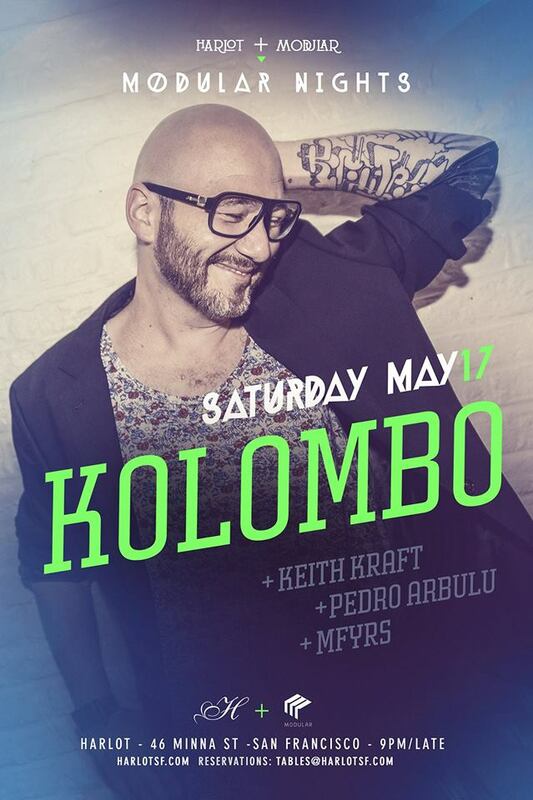 Kolombo – Official Fan page, Crosstalk, Keith Kraft, Pedro Arbulu, MFYRS. Join our mailing list at http://eepurl.com/HWLPH to stay up to date on everything Modular and for a chance to get your hands on some Modular Access all night passes.